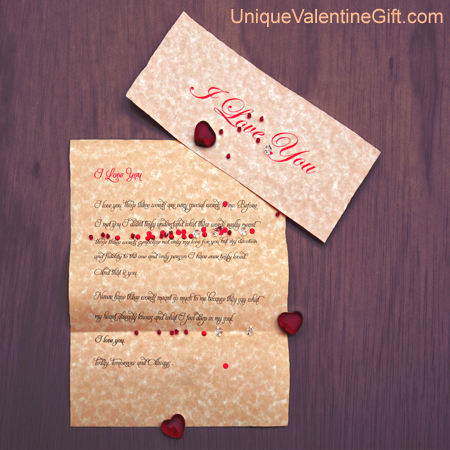 Unique Valentine Gift presents the I Love You Letter. Cupid now is offering a less expensive, but no less heartfelt, option for the world's lovers: The I Love You Message. The Message is masterfully written and will melt the heart of your loved one. It can be personalized, too, if you so wish. Printed in beautiful cursive writing on real parchment paper (just like the old days) and comes in a parchment envelope for presentation. The Love Poem also makes a wonderful accompaniment to our other offerings, such as The Key to My Heart Love Box, Lovers Bed of Roses, and Aphrodisiac Love Fragrance. - I Love You. By Arlene BrownI love you. Those three words are very special words to me. Before I met you I didn't truly understand what these words really meant. Those three words symbolize not only my love for you but my devotion and fidelity to the one and only person I have ever truly loved. And that is you. Never have three words meant so much to me because they say what my heart already knows and what I feel deep in my soul. I love you. Today, Tomorrow and Always.